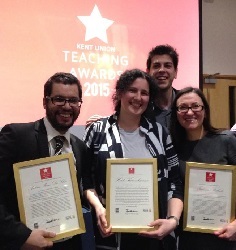 Academics and teachers from the School of European Culture and Languages had a successful evening at the Kent Union Teaching Awards 2015, winning in three out of the four categories in which they were nominated. Luca Di-Gregorio from the Department of Italian was nominated in the ‘Postgraduates who Teach’ category, Dr Heide Kunzelmann from the Department of German won the Academic Adviser Award, Dr Tamara Rathcke from the Department of English Language & Linguistics won the Fantastic Feedback Award and Dr Antônio Márcio da Silva from the Department of Hispanic Studies won the Humanities Faculty Award. The winners were announced at an awards ceremony held at the Canterbury campus on Monday 30 March. Our congratulations go to all those nominated and to the winners.